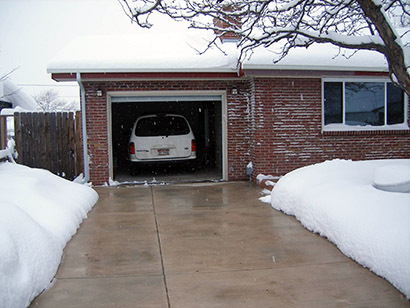 Heated driveways - What is a heated driveway and how does it function? Heated driveways feature a heating element (typically heat cable) that is embedded under the driveway's surface, providing warmth to melt snow and ice during the cold winter months. The most effective heated driveway systems are electric radiant heating systems. These snow snow melting systems are similar in concept to indoor floor heating systems. There are two basic technologies used for heating driveways: electric and hydronic radiant heat. Electric snow melting systems use a line-voltage heating cable, while hydronic systems generate hot water that is pumped through a series of plastic PEX tubing embedded in the concrete. These heating elements used in driveway heating systems use resistant heat cable that radiates warmth outwards across the driveway's surface. Most heated driveway systems incorporate an automatic sensor that detects inclement weather and activates the heating system when certain temperature and precipitation conditions are met. Electric systems tend to be more efficient, require less maintenance, and heat surfaces quicker. However, large hydronic systems may have slightly lower operational costs than large electric systems (depending on the local fuel rates), but are usually more expensive to purchase and install. Both snow melting systems have their advantages; however, the electric systems are more popular because of the price, ease of installation, and the ever-increasing costs of fossil fuels. The advantages of a driveway heating system. 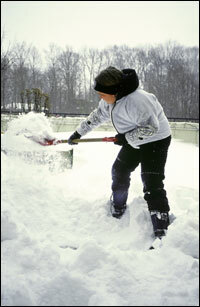 Some of the obvious benefits of a heated driveway are increased safety and the elimination of manual snow removal. The assurance of knowing that your driveway will always remain clear, regardless of the winter weather is another attractive incentive. While the thought of never having to shovel the driveway again is a key "selling point" to many, other important long term benefits include: increasing value to your home, preserving the quality and enhancing the life span of your driveway, and avoiding damage to bordering landscape from the inevitable runoff from harmful salts and snow melting chemicals. Where and when can you install a system? A radiant heated driveway system can be installed in almost any location and medium (including concrete, asphalt, under pavers, etc. ); and nearly anytime of the year, depending on the medium. The ideal time to install a radiant heated driveway is during new construction in relatively warm weather conditions (for concrete curing purposes). However, given today's technology, there are very few limitations as to when a driveway snowmelt system can be installed. Heated driveway systems - How do they work? Radiant snow melting systems are comprised of three main components: the heating element, the controller, and the activation device. The heating element can be either an electric resistance cable or PEX hot water tubing (for hydronic snow melting systems). These heating elements can be installed in almost any medium. The simplest application for installation is under brick or stone pavers and in new-pour concrete. Asphalt can also be used, but the installation methods call for more care and labor to avoid injurious contact to the heating cable because of the asphalt's temperature and abrasive nature during the paving process. Warmzone ClearZone heat cable is the toughest, and one of the few heat cables designed to withstand the stress of fresh concrete pours as well as the extreme temperatures of hot asphalt installations. A driveway snow and ice melting system is controlled by a relatively small, wall-mounted control box, while most hydronic systems require a small room which houses the somewhat noisy mechanics necessary for the system, including a boiler, pump, manifold, etc. Both types of snowmelt systems use manual and/or automatic activation devices. Available automatic sensors include aerial-mounted or pavement-mounted snow sensor switches. These sensors activate the heated driveway system when there is moisture present and the temperature is below a set point (which is usually set to 38 or 39 degrees). Most systems also include a manual timer to preheat an area just prior to a large storm, eliminating snow and ice accumulation. Manual override capability also allows the user to activate the snow melting system to melt snowdrifts or ice, due to wind and shade. Who sells and installs heated driveway systems? Electric radiant snowmelt systems are surprisingly easy to install. Just about any experienced "do-it-yourself" handyman or contractor would be capable of laying out and securing the heat cable for a radiant snowmelt system. However, it is vital (for warranty purposes) that a qualified electrician wire the system. Several vendors provide driveway heating systems, but not all vendors and systems are equal! Research your options, and only deal with radiant heat experts with a proven track record and are customer-service oriented. Also, compare the different driveway heating products and warranties. Warmzone cable is a preeminent radiant heat cable. The snowmelt cable is one of the most durable, longest-lasting heat cables on the market, which is why it is backed by an outstanding manufacturer warranty. As the industry-leading provider of radiant heat and snowmelt solutions, Warmzone is the trusted name among homeowners and professional builders alike. Warmzone's expert staff will gladly field any questions you may have - without the sales pressure - and provide you with accurate, up-to-date information on radiant snow melting technology and custom driveway heating applications, as well as recommendations. For the highest quality products, best pricing and proven customer-oriented service, Warmzone is virtually unmatched. The company is dedicated to providing unbiased radiant heat information and matching customers with the best snow melting solution possible, while keeping within their budget. Warmzone is a consumer and contractor advocate, without bias. Radiant heat specialists at Warmzone will provide FREE quotes as well as point out the benefits and challenges of any project. The experts at Warmzone have extensive experience with both residential and commercial radiant heating projects. WARMZONE © . All rights reserved. Various trademarks held by their respective owners.